Teaching Attendance 2.0 presents a three-tiered system of intervention with clear roles for teachers. This system is being successfully implemented to reduce chronic absenteeism in schools across the U.S. Tier 1 is the foundation of the support system and includes universal strategies that support satisfactory attendance for every student. Tier 2 supports are for students and families who need more encouragement and support in addition to Tier 1. Tier 2 involves building caring supportive relationships, (such as Success Mentors), with students and families to motivate daily attendance and address challenging barriers. For example, if a student is avoiding school because of bullying or academic struggles, educators can take steps to improve school climate or provide academic support. 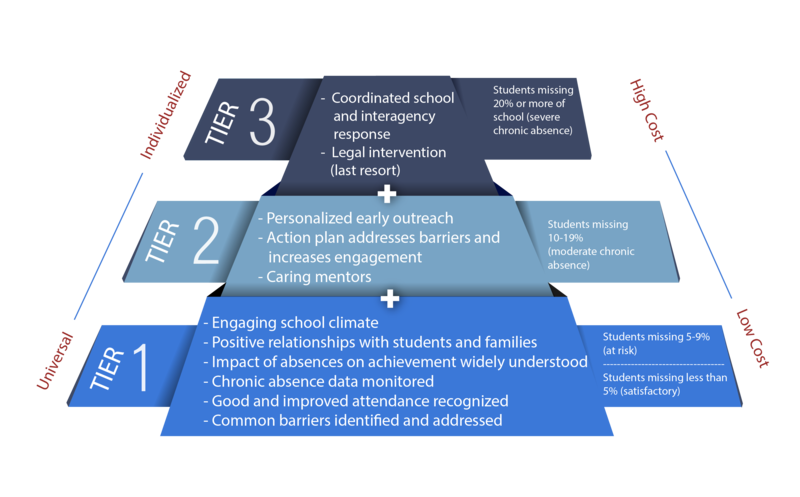 Tier 2 addresses other barriers to strong attendance including transportation, finding a safe path to school and an unmanaged chronic health condition. Teachers and paraprofessionals are essential to implementing Tier 1 and Tier 2 strategies—to create a welcoming environment that makes students and families feel connected to school and to take positive and early action when a student is absent. While a welcoming first impression helps all students it is vital for helping the most vulnerable students feel safe and supported, especially if they are in an unfamiliar school setting. Tier 3 offers individual interventions and supports for students and families from a district’s student support division, public agencies and the courts. Tier 3 interventions are critical for our most vulnerable students who face serious hurdles to getting to school and may be involved in foster care or the juvenile justice system. Both pyramid graphics (below) have identical information. The inverted pyramid (bottom) emphasizes that universal strategies are for all students not matter how many days they are absent. Tier 3 is too late!